NP 18 kicks off with a fantastic tag team bout: babyface brothers 'The Ryner Twins' take on veteran NP heels 'Hot Like Lava' (Cru Jones & Shawn Banks). If Shawn Banks looks familiar to you it's because he is formerly NP star Shawn Wildfire! 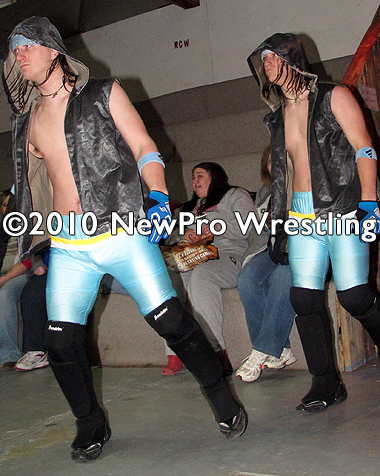 A new alliance with Cru Jones turned this young upbeat babyface into an arrogant muscled heel. The Ryner Twins look very impressive as the match starts, using frequent tags to keep both members of their team fresh and wear down their much larger opponents. A big double hip toss followed by a snazzy double elbow drop set Hot Like Lava up for a very humiliating moment that has them resembling two animals in the wild (pictured below). Furious over this humiliation, Hot Like Lava turns up the intensity and lays into the young faces with a vengeance. The heels use closed fist punches, big body slams, spine-jarring backbreakers, and illegal double-teams to punish the Ryner's for their efforts. A double-team abdominal stretch seems to be wearing one of the Ryner's down to submission but a great effort to make a much-needed tag brings them right back into the match. With all four wrestlers in the ring, chaos breaks loose. A well-done finish that will catch you off guard! NewPro shows how it should be done!